Work is clearly evolving which means that we are seeing new technologies and behaviors enter our organizations. These new behaviors and technologies are largely being fueled by the consumer web and now organizations are struggling to adapt. Over the past few months I explored the Five Trends Shaping The Future Of Work, The 5 Must-Have Qualities Of The Modern Manager, The 5 Must-Have Qualities Of The Modern Employee, and The 12 Habits Of Highly Collaborative Organizations. I highly recommend you check out those articles but I also wanted to create something which visually shows how exactly work is evolving and what areas are being impacted. 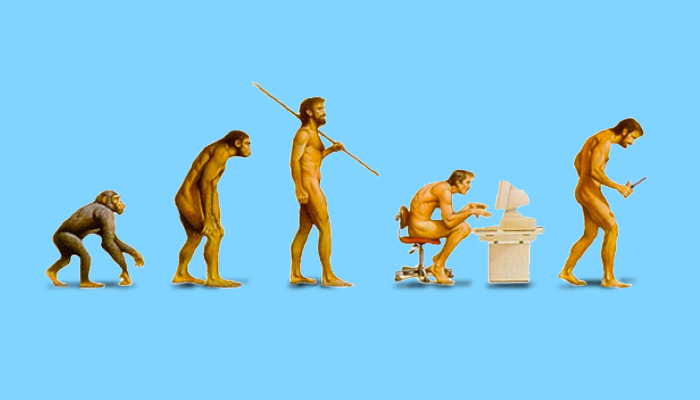 To help do that my team from Chess Media Group and I put together a visual explaining the evolution of work. A high level explanation for each area is provided below after the graphic. Share it with your friends and colleagues who are seeking to understand how the world of work is changing. Instead of the traditional hierarchical model, organizations are adopting a more flattened approach where anyone can speak with and interact with anyone else. There is no longer any justification for keeping people from interacting and engaging with each other because of their seniority level. New collaborative platforms are making this especially easy today. There’s no reason to force employees to work 9-5 anymore. Employees can now connect to people and information anywhere, anytime, and on any device. Working flexible hours makes the company more appealing to new hires, provides greater job satisfaction, and helps employees with work-life balance. Sharing information is part of what is driving the future of business. The successful and progressive companies understand that it’s crucial for employees to share their ideas, thoughts, and content. Employees also have the unique opportunity to become leaders by sharing what they know and what they care about. We do this every day in our personal lives on platforms such as Twitter, Facebook, and WordPress. New technologies for our organizations are making it much easier for employees to share relevant information with the right people. Hoarding is dead. The smart leaders understand the concept of following from the front, that is, removing obstacles from the paths of employees to help them become successful. Scaring your employees into doing what you want is a failed approach to leadership yet unfortunately this is how many of our companies were created; it’s time to evolve this way of leading.